Successfully Added MP3 Music Player Pen with FM Tuner + Voice Recorder - 1GB to your Shopping Cart. 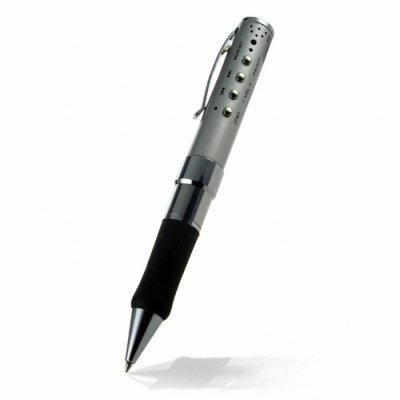 This 1GB MP3 player comes with and FM tuner and voice recorder all wrapped up in a professional writers pen. This nice gift item is ideal for those who enjoy writing as well as listening to music simultaneously. You'll be amazed at the ability to record hours of audio from the high quality MIC, carry data safely from the office and still sign the bill at the restaurant for dinner. Imagine writing notes from your professor as you listen to his recorded voice, or maybe making a audio recordings of all your friends, or even just shocking people on the bus when you take out your pen and listen to music as you do the crossword. The CVSC-200-1GB makes an ideal gift for any relative, friend or family member. With this wholesale priced item, all this and more is possible. This MP3 pen is available to you at no M.O.Q. (no minimum order quantity) so get yours today, and a couple as Christmas gifts for family or friends an low factory direct wholesale price, straight from the leader of wholesale electronics, Chinavasion. Bonus: Premium quality gold plated earphones now included! !